Some days being a shop owner can be a little trying! Like when the furnace goes out in the store and it is cold and we still have to use our fingers! The good news is that we don't need a whole new furnace, just a new circuit board and it is not -20 outside and we have space heaters we can sit in front of. Also, I get to go on vacation to Palm Springs tomorrow so at least I will get to be warm! Hopefully the part will be here tomorrow and the problem will be solved and I won't have a mutiny while I am gone ! When I get back we will hit the ground running with retreats. Everyone needs a retreat after vacation right? Then baby time!!!!! I did get a baby quilt and a flannel receiving blanket made. 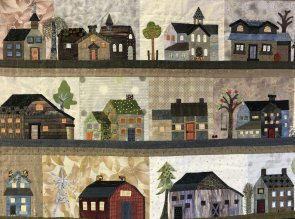 The beauty of modern quilts is there is very little piecing so they can be made quickly and there is all that wonderful negative space for quilting. With baby quilts, putting a binding on by machine is great because they wear much better with all the washing they will go through. Add minky for the back and it is an instant hit! Perfect for anyone with a busy schedule! 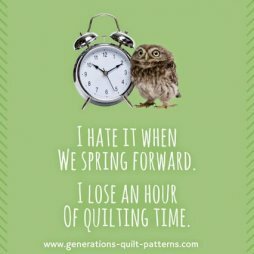 Have a wonderful March with everything spring in mind: longer days, daylight savings time,warmer weather, St Patrick's Day, Easter, and don't forget that it is national quilting month! Our classroom is always open for groups to use. Just call ahead to check if it is use. We are also happy to schedule a class for a group upon request! Take a Trip Around the World with Sharon! This class is continuing with learning the basics of quilting. Come learn the art of needle turn applique (or fuse if you prefer) from one of the very best! Renee will be sharing all of her secrets for perfect houses! Book by Yoko Saito required. Bring your own projects to work on and let us serve lunch. 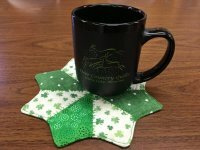 We have just gotten started with this wonderful new block of the month! If you would like to participate, please come and join us.